Oh that’s very joyful Krista. your artwork tells us so much about yourself – and it’s all good! oh this is so so wonderful!!! what a cute piece!!! your style is very unique!!! Aaah, that’s WONDERFUL! Mama is always right. I just love their poses! OOOOh this is just so old fashioned and sweet! Very beautiful illustration. Thanks so much for you kind words. I so appreciate them. They are heart felt. Thanks again and again. awwww, this is so cute Krista and I really love your new header and background. It’s like a fall festival of fun! 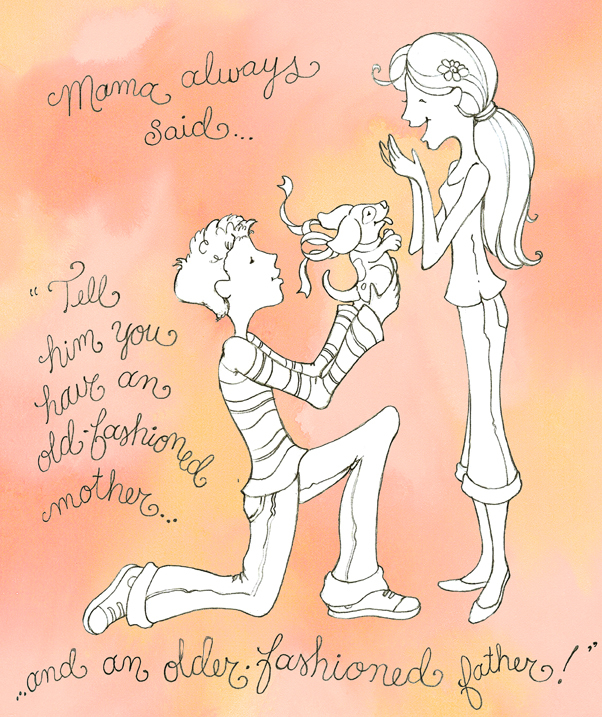 Love the quote and the sweet illustration. Sweet and so perfectly old-fashioned. Hey Krista! The lines in this are remarkable! The puppy looks just as excited as she is. Great quote too! I was originally going to do an old-fashioned marriage proposal with a very similar pose… but switched gears. Glad I did because you nailed the pose and the expressions. Yes “avocado” green was the in color and smacking the top of the T.V. was our work-out :o) Thanks for making my day! Ooooh, this is just darling. You’ve brought a smile to my face once again, dear Krista!